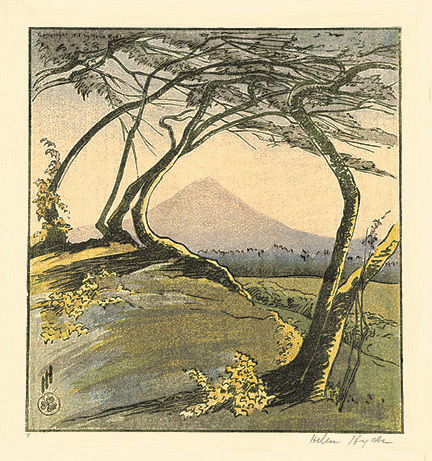 The Bamboo Fence - - 1904, Color woodcut. Mason & Mason 54. Edition not stated. Signed in pencil in the image, lower right. Numbered 68 in pencil in the image, lower left. Titled and dated in pencil in the bottom left sheet edge. With the artist's monogram in the block, upper right. Image size 5 1/8 x 11 1/4 inches (131 x 287 mm), sheet size 6 1/2 x 12 1/2 inches (165 x 318 mm). A fine, fresh impression, on tissue-thin cream Japan, with margins (1/2 to 11/16 inches), in excellent condition. Collections: AFGA (CSL & DeY), AIC, LC, NYPL, UOMA, ZAM. 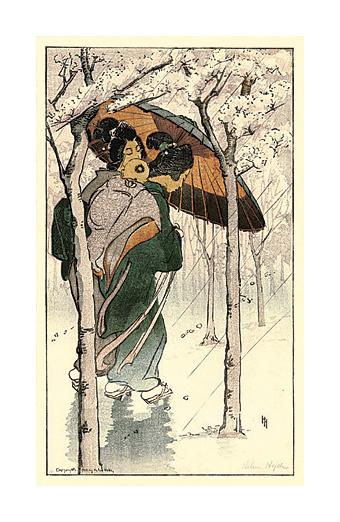 Cherry Blossom Rain - - 1905, Color woodcut. Mason & Mason 60. Edition not stated. Signed in pencil in the image, lower right. Numbered 28 in pencil in the image, lower left; with the artist's monogram in the block, lower right, and Copyright, 1905, by Helen Hyde., lower left. Image size 17 x 9 7/8 inches (432 x 251 mm), sheet size 18 1/4 x 10 5/8 inches (464 x 270 mm). A fine, fresh impression, on tissue-thin cream Japan, with margins (3/8 to 3/4 inches), in excellent condition. Collections: AFGA (CSL & DeY), AIC, LC, UOMA. 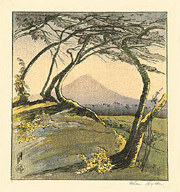 Mount Orizaba (from Jalapa) - - 1912, Color woodcut. Mason & Mason 98. Edition not stated. Signed in pencil in the image and beneath the image, lower right. Numbered 9 in pencil, lower left. Titled and dated in pencil in the bottom left sheet edge. With the artist's monogram in the block, lower left, and the artist's seal in the image, lower left. Image size 9 11/16 x 9 inches (246 x 229 mm), sheet size 13 1/4 x 10 7/8 inches (337 x 276 mm). A fine, fresh impression, on tissue-thin cream Japan, with margins (3/4 to 1 7/8 inches). A printing crease in the bottom right sheet edge, otherwise in excellent condition.